I did not know Joan Armatrading until 5 years ago when I went to concert featuring her and Brian Ferry. I have been Brian Ferry’s fan since his Roxy Music days (and I still am) but I had to admit that Joan Armatrading made him a bit pale that night. We went to her concert in Takapuna late last month. 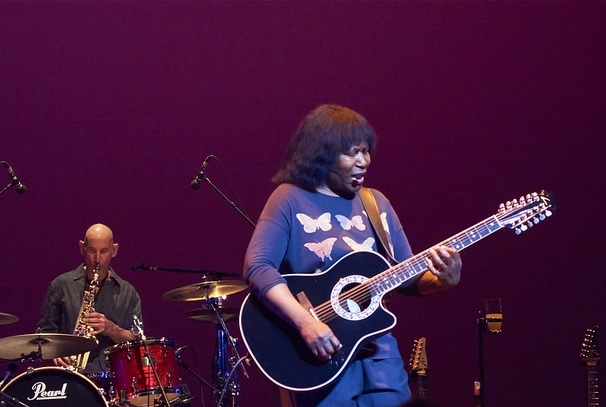 Although the venue was far from perfect (how could they get away with no aisle and tiny fire exits – I do not know), Joan Armatrading’s performance was excellent and her sense of humour hilarious. She played several tracks of her new album “Starlight” that we did not know but liked them anyway. The old number “Love and Affection” was still beautiful with Joan on her 12 string guitar. It cannot be said that she is a pretty girl but her voice is beautiful and her personality very warm and likable. It is quite clear that she does not have to glam herself up to be on stage. Her voice and her music are glam and powerful enough to hold attention of the audience. What? Me? I’m doing nothing naughty, really!